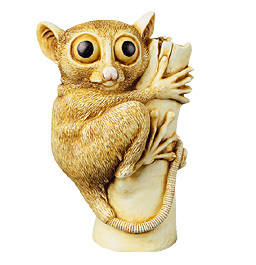 “Bush Baby” is a solid body figurine similar in size to a Small Treasure Jest. Bush babies are endangered primates, and Peter Calvesbert’s profound concern for these wide-eyed creatures is evident in every detail of his carving. The worldwide edition size of “Bush Baby” is 2500. To make the hunt even more exciting, a color variation will be introduced. In the Americas, 1800 of the pieces will have orange eyes and 200 will have green eyes. In the UK, 450 “Bush Baby” will have orange eyes and 50 will have green eyes.